There’s a distinct aroma to the Melbourne food scene at the moment. It’s the waft of slow-roasting brisket and sweet, rich sauce. American barbecue restaurants are on the rise, and it’s no different in Footscray in the city’s inner west. Chef Shayne McCallum and restaurateur Alan Sam, who’ve had phenomenal success with their burger joint 8bit, have brought a little taste of Texas to the rapidly gentrifying suburb with Up In Smoke. There are no rustic touches, like cows’ horns hanging on the walls, though. Architecture firm Munch Valentic have taken cues from the industrial heritage of the area and the huge Yoder Frontiersman smoker, visible from the dining room, in their design of the space. 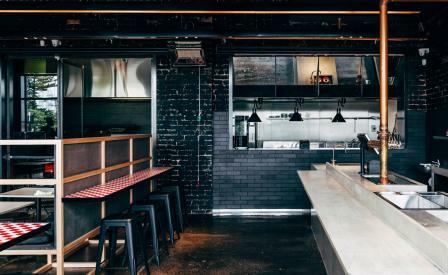 Copper piping, black-painted brick and an old-school letter board feature in the bar area, while the restaurant is divided into booths using blond timber framework. Concrete-topped tables, wire chairs and black leather cushions complete the scene. Outside, there’s a small, sunny beer garden facing the street. The menu features many of the barbecue classics, including pulled pork and beef rib from the smoker, hot wings, brisket beans and mac and cheese. But there are also a few less-expected items – fried smoked mozzarella sticks, smoky babaganoush (eggplant dip) with tortilla chips – on offer. Craft beers are available on tap, and there’s a decent selection of bourbons to continue the Americana theme.